Chester Cricket was a country cricket. He enjoyed hopping around in his meadow, sitting on his stump, and eating liverwurst. 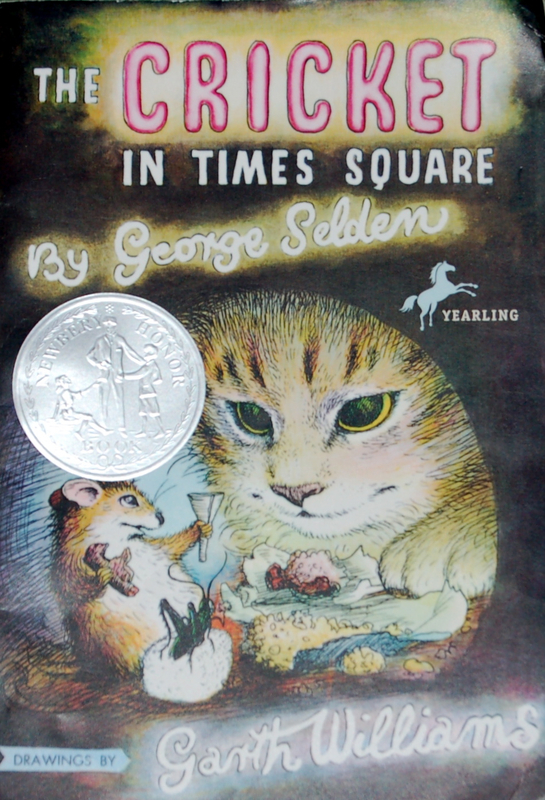 Chester Cricket hopped onto a picnic blanket to eat part of a liverwurst sandwich - and found himself bundled up with the sandwich into a picnic basket and, via, trains and the subway, he ended up in a pile of dirt in the Times Square subway station. Chester Cricket made some very good friends in the Times Square subway station. Mario, whose family owned a newspaper stand, heard Chester's chirp and carefully dug him out of the dirt and trash - and made a home for him in the newspaper stand. Harry Cat and Tucker Mouse, who lived together in a drain pipe in the Times Square subway station, became Chester's friends - talking with him or showing him around whenever the humans were away. Chester had some adventures with Harry and Tucker like seeing Times Square at night, and sleeping in the newspaper stand cash register (and waking up to find he'd eaten some money). When Tucker turned on the newspaper stand radio late one night, Chester discovered that he could make music like the tunes he heard on the radio. Tucker, Harry, and Chester tried out different radio stations and types of music - from opera to pop - and found that Chester could play everything he heard beautifully. Mario's family didn't have much money. The newspaper stand barely made any money. When Chester began to make music that humans recognized - opera, classical, and popular tunes - people crowded around the newspaper stand to listen, and bought newspapers and magazines. Eventually, Chester grew tired of performing concerts at the newspaper stand. He gave one last private concert for Mario, then (with Tucker and Harry's help) got on a train headed out to the country. This is a wonderful story - full of friendship, problem-solving, and music. Thanks for the comments, and for stopping by through the Kid Lit Blog Hop! This is a great book – one of my daughter’s favorites.